I’m now back in Northern California with my manfriend/boyfriend/thing (who left Saturday), and I took him to La Victoria, in-N-out Burger, Pan Tao for real Chinese, Lee’s Sandwiches, a couple pho places, the Golden Dragon for dim sum, and Twist cafe. I promise I will tell you about them all at some point, but now I have to tell you all about my farewell brunch and how awesome it was. I made 3 dozen corn muffins, 2 bacon quiches, a 7-egg veggie scramble, and 2 frozen bags of tater tots for 16 people, in addition to fruit, iced coffee, and mimosas. 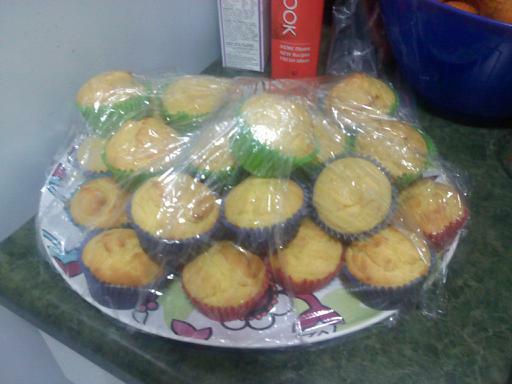 There were 4 corn muffins left at the end, and a couple wounded soldiers of champagne. Needless to say I was a beast in the kitchen. I’ve already posted my bacon quiche recipe, so I guess I’ll just post a couple pictures. The corn muffin recipe was from the back of the GOYA corn meal package. Really simple, really tasty, as usual. All in all it was a great way to say goodbye to (almost) everyone who had made my NYC experience amazing. I mean, you really can’t go wrong when you offer people free food. OH, that was the other thing: my friends brought me alcohol, fruit, juices, and a pie! So there was that, too. i made all 3 dozen corn muffins the night before. so cute! 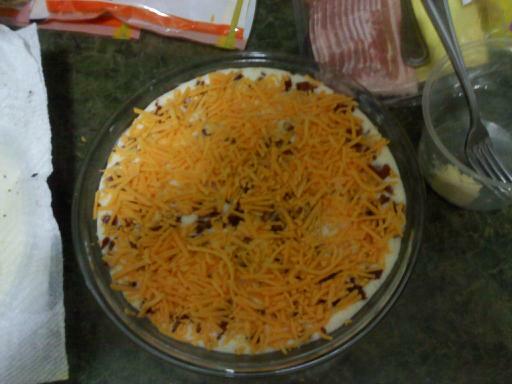 the quiche before i put it in the oven. less appetizing here, but sooo delicious.